I have been looking for an infuser water bottle since I saw that they came out, so I’m so glad I got to try out this one from GiantBest. I love to drink water to stay healthy but I get really bored with drinking plain water. A lot of those flavored waters you buy at the store end up tasting fake or in some cases just gross. So I was super excited to try this more natural alternative. With this bottle you open it up and unscrew the infuser. Fill it with your favorite fruit combination and place it back in the bottle. Pour in come water and you have natural fruit infused water. I love this particular bottle because it has graduated sized holes in the infuser to help infuse the water evenly. I love the design of the bottle, I like that it has a sleek clean look. It also comes with an insulated sleeve you can put over the bottle to help keep the contents cold. It has a flip top lid that presents a great spout for drinking. When I used it I put in frozen fruit so it would keep my drink cool and infuse the water all at the same time. The water tasted great and did a great job of infusing the water. It was much better then the store bought flavored water that’s for sure! I highly recommend getting this bottle if you are a fan of flavored water. ★ PREMIUM QUALITY INFUSION GLASS WATER BOTTLE: Do you want the perfect infusion glass water bottle for working out or daily use? Forget high sugar drinks, unhealthy soft drinks and ultra sweet beverages, our Glass Water Bottle Infuser is a stunning, professional quality Fruit Infuser designed for the demanding user, allowing you to fill the bottle with real fruit pieces and tea leaves to create the healthiest range of all natural drinks including flavoured fruit infused water, juice, iced tea, lemonade real, detox drinks, and many, many more, perfect for users who demand the very best! ★ REMOVABLE FRUIT INFUSER WITH SUPER TOUGH INFUSER FILTER:why settle for cheap quality drinks with seeds and fruit bits? 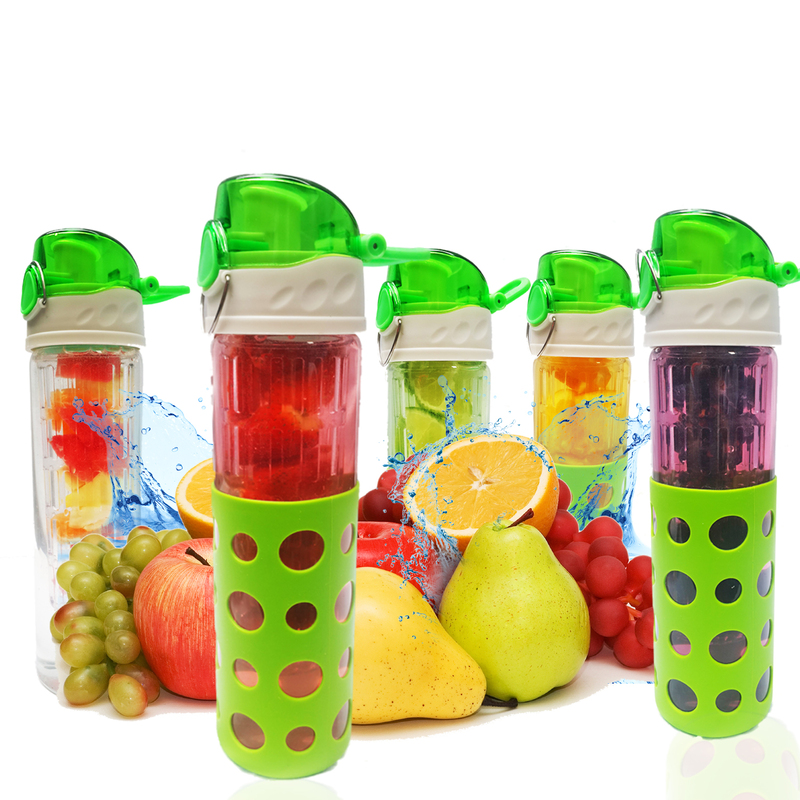 Our Fruit Infuser uses an ultra high capacity, removable fruit infuser with largemouth bottle, allowing you to include real cut fruit to naturally create your own infused water, together with a high quality infuser filter guaranteeing the smoothest drinks free from seeds, pips and fruit particles! Use with lemons, limes, mint leaves, mango, berries any many more fruits and natural tea leaves to create a range of natural, healthy detox drinks! ★ 100 PERCENT BPA FREE ULTRA TOUGH BOROSILLICATE GLASS DESIGN: Do not buy cheap plastic water bottles that leech chemicals and toxins into your drink leaving a bad taste and plastic smell? Our premium quality Fruit Infuser uses the highest quality, eco-friendly, recyclable and reusable ultra tough borosilicate glass material which is 100% BPA free and won’t leech harmful chemicals into your drink, and can be safely used. Ideal for the office, school, work, gym, yoga, hiking, camping, running, travel! ★ LEAK RESISTANT DESIGN FOR CONVENIENT CARRYING: designed for super tough, durable use whether in your kitchen, working out at the gym, taking a yoga class, hiking or travelling, our Fruit Infuser is perfect for carrying in bags, with a super leak resistant design, including secure plastic flip-top with one-touch button locking, silicone spout seal, and metal locking clip. Carry our Fruit Infuser everywhere and naturally create your own infused water, with the peace of mind our infusion glass water bottle won’t drip or leak or damage! ★ 100% MONEY BACK SATISFACTION GUARANTEE: guaranteed money back if it’s not what you expected; we guarantee our Fruit Infuser is the highest capacity, easiest to use, leak resistant, super tough Fruit Infuser on the market allowing you to create the perfect drinks, and is completely dishwasher safe, fur super convenient cleaning and easy use together with an eco-friendly, recyclable BPA free bottle. Buy with confidence, completely risk free; if you’re not 100% happy with your purchase, we’ll happily refund your money, no questions asked! For the perfect quality, healthiest natural drinks, click the Orange Button to order now!